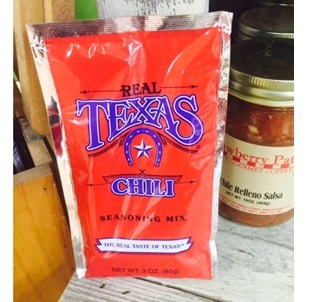 Real Texas Chili Seasoning Mix has the real taste of Texas. This chili has good heat built in with a tomato base flavor. Makes 3.5 quarts of some of the best tasting chili this side of the Red River. The Real Texas Chili mix from Bear Creek Smokehouse is blended from premium quality round chili peppers and specially selected spices. Add the seasoning to 3 pounds of meat for chili well browned and drained. Add 1 medium onion, 2 - 28 ounce cans of diced tomatoes, 1 - 15 ounce can tomato sauce and optional beans. Chili pepper, salt, a special blend of spices, and garlic.